Her name is Medusa, named after the golden-haired priestess of Athena, who defied her vows of celibacy to marry Poseidon, the god of the sea. Her punishment for love? “each lock of her golden hair was turned in to a venomous snake; her once gentle, love-inspired eyes turned in to blood shot, furious orbs which excited fear and disgust in the eyes of others”. The modern-day incarnation of Medusa is a six-meter Great Hammerhead shark, pregnant when Pamela Martin first met her in the shallow, sandy waters of the Bahamas, she was a gentle, magnificent, beauty that is unfortunately as misunderstood as her goddess name sake. Sadly, Medusa and her kind are listed on the IUCN Red list as Endangered with decreasing numbers. As high as 80% of the species have already been lost. While the fight for women’s rights continues, we live in times of great change. Now more than ever the expression of a woman’s beauty, grace and power is excepted, revered and even celebrated. It is now time to give back, it is time to right the wrongs of the past, it is time to save Medusa. Join Earth Angles on a very special journey to explore the mysteries of the deep and meet the oceans embodiment of the feminine, the rare and endangered Giant Hammerhead shark. Established & incorporated in 1990 by Dr. Samuel Gruber, the Bimini Shark Lab - Biological Field Station Foundation (BBFSF) is a 501 (c)(3) non-profit organisation located on the island of South Bimini, Bahamas. The mission of the BBFS Foundation is to advance our knowledge of the biology of marine animals especially the heavily impacted elasmobranch fish fauna (sharks and rays); to educate future scientists at undergraduate and graduate levels; and to disseminate research results to advance the field of marine science and conservation biology, as well as raise public perception and awareness of sharks and other marine species. Understanding the biology of sharks and rays and the role that they play in the marine ecosystem through cutting edge field and laboratory research spanning multiple disciplines such as molecular and behavioural ecology, physiology, conservation and sensory biology. Educating future scientists through providing opportunities for students, to design and conduct research projects at the undergraduate and graduate level, to complete advanced university degrees in the marine sciences; and through voluntary training as interns, thus advancing their field experience and skills. Enhancing conservation and awareness through disseminating our results to both the public (tours of our facility, talks, TV documentaries, social media, posters and blogs) and scientists (peer-reviewed journals, conference presentations and posters, fishery reports and books). 100% of the profit of this film will be donated to The Bimini Shark Lab – Biological Field Station Foundation. Part 1 - The challenges faced. Sharks worldwide are facing extinction with up to 80% of Great Hammerheads disappearing from our oceans in recent years. Overfishing is the chief threat to these incredible sharks. Driven mostly by Asian demand for shark fin soup, sharks are “finned” after capture and then flung back in the ocean alive to slowly die from blood loss or starvation. Many hammerheads also die as accidental bycatch in large commercial fishing nets in the Atlantic Ocean and massive illegal fishing of hammerheads occurs in the Indian Ocean and near Africa. Direct conservation efforts for the Greater Hammerhead shark and other hammerheads is close to non-existent, even though shark fin soup is illegal in the European Union, the United States, and Australia. Much work remains to be done and the highly migratory nature of the shark makes it difficult for specific nations to provide adequate protection in a race against time to save the species. The great hammerhead shark (Sphyrna mokarran) is a circumglobal species inhabiting warm temperate to tropical coastal waters. They are found over continental and insular shelves, as well as adjacent deep waters and is thought to be highly mobile and migratory. They are long-lived with an estimated age of 44 years, slow-growing, and are a late-maturing species. Observations and captures at the Bimini Shark Lab are repeatedly and frequently documented and studied. The centre is a collaborative research project that combines telemetry and genetic data with modern analytical and ecological techniques to examine the conservation, habitat and migratory patterns of the endangered Great Hammerhead shark. In a wide variety of fisheries throughout their range they are targeted or caught as bycatch. Due to this world-wide population declines are suspected. Their highly sought-after large fins are prized in Hong Kong fish markets and have been documented as the second-most abundant species in the international trade in fins. Such declines and susceptibility have led to a global effort to enhance their management and conservation. In March this year Giant Hammerheads were added to CITES (Convention on International Trade in Endangered Species) Appendix II and were categorized as endangered by the IUCN (International Union for the Conservation of Nature) Red List. 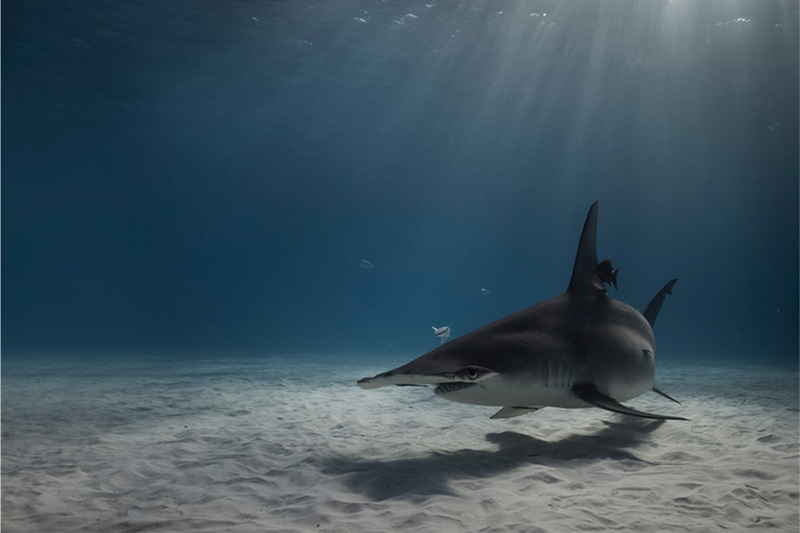 Being in the water with an endangered Giant Hammerhead is an experience that has the ability to change perspectives on the nature of sharks forever. These gentle giants are one of the rarest and most awe-inspiring sharks on the planet. The white sands and crystal-clear waters of the Bahamas are the temporary home of these rare and beautiful creatures and provides the perfect opportunity for the Earth Angle Crew and participants to document and experience first-hand their true nature. The sharks slowly approach us in water only ten meters deep with trained professional dive masters, making encounters with these magical creatures of the deep both safe and an experience participant will never forget. Through breathtaking footage, imagery and story-telling the mission of Earth Angels and this film is to; provide educate, inspire protection and experience the endangered hammerhead in a rare and unique way. Telling the story of the Giant Hammerheads of the Bahamas would not be complete without experiencing the ocean in its full glory. The abundant waters off the coast of Bimini are also home to String Ray’s, Manta’s and Wild Dolphins and are an intragral part of the fragile ecosystem surrounding the islands. A playground of adventure tourism Earth Angles will delve in to the advantages and pitfalls of wild animal eco-tourism. Cutting edge medical research in to shark DNA provides exciting new insights into their ancient and efficient immune systems they have developed over the last 400 million years. New studies of shark DNA, including that of the endangered Great Hammerhead shark, reveals unique modifications in their immunity genes that may be connected to their rapid wound healing capabilities and possible higher resistance to cancers. Sharks and rays are highly efficient wound healers and are suspected to show a greater resistance to cancers. This important research brings us closer to understanding, why sharks exhibit some genetic characteristics that are highly desirable to humans. Other studies in the rapidly growing field of shark genomic research are providing clues in to the mysteries of various cancers, bone disease, wound healing and longevity. The apex predator of our oceans just may be the key to unlocking some of the mysteries of human health that have so far eluded mankind. Providing us with yet another reason to save dwindling shark populations from the brink of extinction. If we lose the world-wide fight to save Medusa and her kind we lose the ideology of what she stands for; the graceful embodiment of the feminine, the awe-inspiring power of an apex predator and a true hero of the deep. We also stand to lose the gifts she offers us, both known and yet to be discovered, the lessons we can learn, the mysteries we can unlock and the reminder that we are all perfectly connected in more ways than can be describe or conceived. If we could only choose, in time, to open our minds and hearts, look at what we fear and learn to love, we in turn might just be saving ourselves.